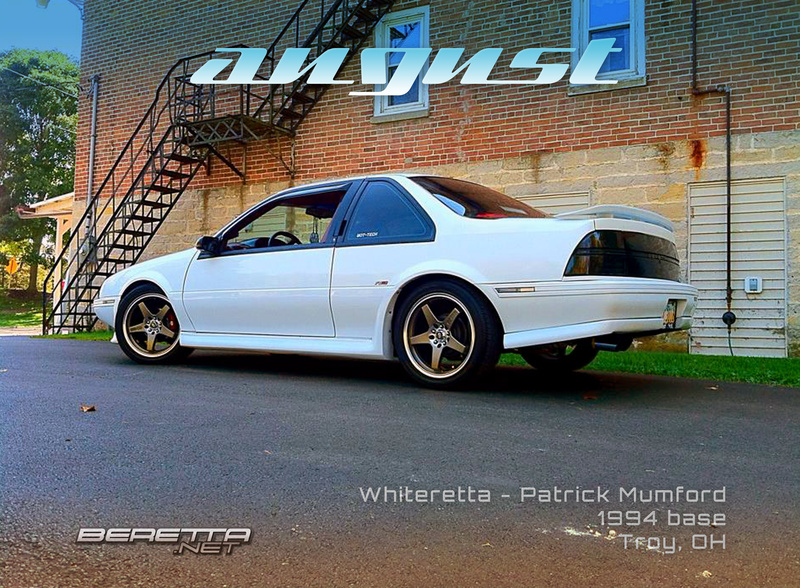 Patrick Mumford/Whiteretta – 1994 Base GTU Conversion. I bought this car back in May 2008, as a replacement for my 1995 Bonneville, which had originally replaced my first Beretta, an ’89 base with the 2.8 in it. After my first Beretta, going a year without one was way too long. My ’94 started out life as an abused 3100 auto, with what seemed like a rather neglected past. I paid too much for the shape it was in, but as soon as I saw it I fell in love with it. After two years of ownership, I decided it was time to upgrade it’s performance. The engine of choice was the common swap 3400. After lots of research and realizing the engine I had picked up needed a full rebuild, I decided to upgrade the cam to a Comp Cams street cam, install yellow LS springs, run all solid and poly mounts, a 65mm TCE throttle body, and PaceSetter headers. Over the past few years I’ve also added an Indy GFX kit, upgraded to the bigger solid front and rear bars, Canuck springs, 17×7 Enkei EV5’s, and numerous other suspension, exterior and interior modifications and upgrades. Too many to list! Unfortunately, it turns out the “engine builder” was a bit of a drinker, and failed to properly torque a majority of the bolts on the engine… This resulted in numerous, and sometimes quite extensive repairs taking up too much of my personal time, up until last summer. Last summer the bottom end went out, for the second time. It was at this point I decided it was time to farm out the work to someone else and go all out, and 3500 swap the car. All power adders were being switched over as well. The car is still undergoing the swap due to complications, and I hope to finally have the car back from the current builder before summer is up, so I can see what she’s really capable of!